Wellingborough based fabricators Astraseal Trade have recently added the full range of aluminium patio doors from Smart Systems to their product range. This latest addition provides installers working in the commercial and residential sectors across the UK with the chance to take advantage of three of the leading aluminium patio door systems on the market. 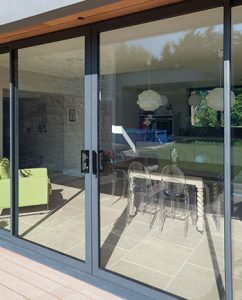 Smart Slide 2000 patio doors have been designed for use in residential environments, although the Visoglide Plus and Ultraglide systems are ideal for residential or commercial applications. For customer’s requiring sashes that are particularly large in size, the Ultraglide system is ideal. Thanks to polyamide thermal breaks, heat transmittance is significantly reduced so warm interior spaces can be created. The Smart Ultraglide patio door system achieves low U-Values of just 1.5 W/m2k, meaning they are some of the highest performing aluminium patio doors on the market. In terms of security, each door is fitted with toughened glazing that has been internally glazed and the latest Winkhaus multi-point locks so you’re able to offer your customers total peace of mind. Featuring the slender framework expected of modern aluminium patio doors, well-lit environments that feel incredibly spacious can be created because vast quantities of natural light is able to make its way inside. This also means that, for projects requiring unimpeded external views, each system is an ideal solution. Immune to rust, warping and corrosion, these doors are long-lasting and low maintenance. 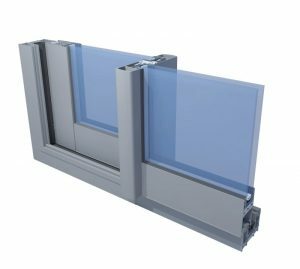 Available with either 2, 3 or 4 door leaves, double or triple glazing and with a dual or triple track, their project suitability is virtually universal. Additionally, inline sliding or lift & slide options are at your disposal along with any RAL colour, anodised and non-anodised finishes plus single and dual colours. Because the expert Astraseal team manufacture each door in-house, regardless of the chosen door configuration, the quality is consistently superb. These aluminium patio doors mark another addition to Astraseal’s wide selection of glazing products from Smart Systems. Their selection of smart products contains various windows, entrance doors and bi-folds. However, Astraseal also manufactures an extensive selection of PVC-U products from market-leading Eurocell, REHAU and Syseal profiles. Therefore, Astraseal is more than capable of meeting a variety of alternative project requirements. Astraseal has spent over 30 years building a reputation as one of the UK’s leading fabricators of aluminium and PVC-U. Taking advantage of the latest advances in manufacturing as they become available, Astraseal offer fast lead times, competitive prices and nationwide delivery. For more information, call 01933 227 233 or contact them online.